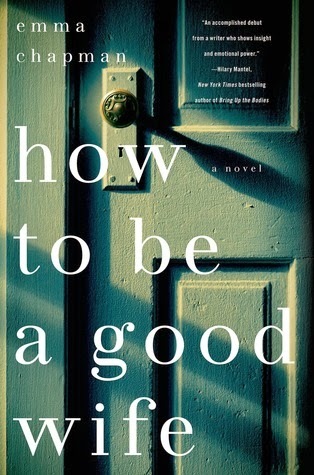 Emma Chapman's debut novel "How to be a Good Wife" is a well written, compelling read with many layers, all of which revolve around the main character, Marta. Marta has been married to Hector for a long time. In fact, all of her adult life has been spent catering to him, their marriage, and their son Kylan. Now with Hector becoming distant and Kylan living in the city with his girlfriend, she has a lot of time on her own. But time on her own is not what Marta wants or needs. As the book unfolds, the author reveals more and more about Marta, and what we learn, or do not learn as the case may be, is what made Marta's story such a compelling read for me. On first impression, Marta's life seems to be comfortable and mundane. She has reached middle age, raised her son, taken care of her husband. On closer examination, though, there are gaps and inconsistencies. Why does she keep finding cigarettes in her pocket with memory of smoking them? What is the medication that she has stopped taking? Before long Marta's story peels off into a couple of directions with no real explanation of what is fact and what is fiction. These different aspects of her story continue all the way to the conclusion of the story which I did not see coming at all. All of this ambiguity in the story may set some readers on edge, but I found it interesting and thought provoking. I also found the ambiguity to be a great discussion point among readers. In fact, when discussing this book with others, I was extremely interested to see how many different ways to interpret the story people were able to find. All that discussion and differing viewpoints only enriched the story for me, enough so that I wasn't upset that the author ended the story without answering the most important questions posed throughout. That is not to say that I didn't find the ending disappointing, but my disappointment was in Marta and her choices, not with the story or the author. I would definitely recommend this book as a thought provoking read, with one caveat. Keep an open mind as you read it and wait until you are finished to draw any conclusions. Then discuss away with others and see what conclusions they came to and how they arrived at them. I guarantee the discussion will be lively.